This meal was more like a savoury cake - it looks quite spectacular and goes a long way as it is quite filling. I have given you the quantities as I made it, however I would cut down on the noodles when I make it again as it was slightly high as is. I would suggest making it with 150 - 200 g of noodles instead of 250 g, and it will be easier to eat then! Cook the noodles until just tender, as per packet instructions. Drain and cool. Preheat the oven to about 180°/160° fan forced. Mash the red salmon with the liquid and add the diced tomato, dill broccoli and lemon juice. Mix well. Mix the noodles with the eggs, ricotta and the spring onions until they are well coated. Line a 20 cm springform with some baking paper, and press half the noodle mixture on the base. Put the salmon mixture on top of these noodles, and press down very slightly to make it fairly even. Add the remaining noodles and once again press down. Add the grated cheese, and bake in the oven for about 35 minutes or until the top starts to turn a golden colour. Let it stand for a few minutes before slicing and serving. I served it with a side salad of my nectarine, quinoa salad. It could also be cut into smaller squares and served at room temperature as party food. When fishing are you able to take the fish off the hook? 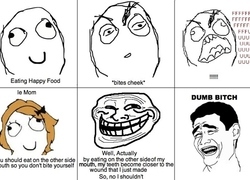 Have you ever had the misfortune to bite your tongue or cheek while eating? Do you ever watch Law and Order SVU?? Hi Tess -any type will do - think I used vermicelli thin ones for this. I think they were Chinese but any type of noodle would work, even egg noodles would be nice.